I truly believe in the Power of the First Sentence!. I did stare many, many times at a blank blogger post thinking & re-thinking about how to start my post. I have my recipe typed et al, but I don't know how to write a prologue to make it more personal and most importantly interesting to me and my readers. As the article suggests, I think keeping an exclusive journal of only first sentences works for somebody like me. that ways, it would definitely give me an instant kick start. :). What say? As I said, a zillion times before on my blog, to me, my Mom is world's best cook. She is absolutely amazing in whatever she does or cooks and I would wanna be like her when I hit 50!. Both of the today's recipes - Putnala Podi with Garlic and Kandipodi aremy mom's creations, which she might have made numerous times since my childhood. She is just a phone call away to ship us both a kilo of these yummy podis from India to here. :D. Probably, I will ask her to do so, once I settle in CA with S.
Image courtesy my sweet SIL, Shri of Tasty Touch. Dry roast 1cup Peanuts with 1 teaspoon Coriander seeds , 10-15 dry Red chillies (depending on desired spice level), until very light brownish color. Add 1 teaspoon of Cumin seeds (on warm peanuts) and mix well. Cool completely. Grind - Above peanut mixture with 1.5 cups of Roasted Bengal gram (Telugu: Putanala pappu) and Salt. Punch 1 whole Garlic, with skin and drop in the last 2 grindings. Separately dry roast - 2cups of Toor Dal, 1cup of Chana dal, 1cup of Mung dal and 2 teaspoons of Cumin seeds. Cool them completely. Grind them all together with salt into a fine, grainy texture and add 2-3 teaspoons of Red chilli powder in the last grinding. Serve with anything - from hot rice to dosas & idlis to add that extra oomph factor! :).. store the rest in an air-tight container. I was introduced to the power of podi when I came to Bangalore. love these podis. 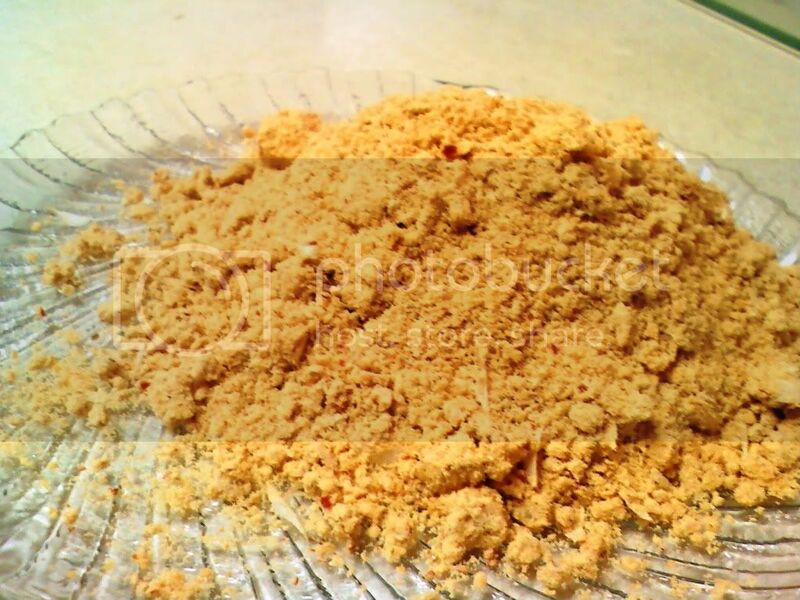 between is Putnala Podi also called gun powder? Podi looks lovely. Moms are the best!! Podi's come in handy when we are in a rush and the first podi sounds interesting.